Bojack Horseman Season 2 Review – What are YOU Doing Here! Bojack Horseman is back with a second season filled with laughter, sadness, and just enough insanity to remind me why I love this show. I’ll admit that the first season of Bojack Horseman came as an unexpected but pleasant surprise to me. What initially seemed like a simple yet absurdist comedy show of a famous horse actor from the 80’s ended up in a very different place by its end. The first season managed to far pass my expectations as it slowly spiraled into a very real and sobering look at the lonely life of a sad, narcissistic, destructive individual. The point at which the show makes this turn felt a bit jarring and helped to catch the viewer off guard with some hard hitting themes. So now that this thematic shift has occurred, I found myself wondering how the second season would handle this and proceed. Though it’s not as disarming in its insightfulness as the first, this second season manages to fulfill that same introspective sentiment while providing laughs and parody throughout. This new season picks up shortly after the last left off, with Bojack (played by the always awesome Will Arnett) acting in his dream role as the star of a Secretariat film. As filming progresses and is plagued by numerous problems, Bojack, rather than finding happiness and clarity, continues to remain his unhappy and cynical self. If the first season was about Bojack admitting and coming to terms with his unhappiness, this season is spent on solving the question of why, and how it can be helped. Rather than the very sudden and hard transition the last season had in its tone, this theme runs throughout these new episodes, more mixed with the comedic nature. Thankfully, things still do get very real and emotionally driven, and it’s moments like these that make Bojack Horseman as memorable as it is. Not to say that the comedy isn’t great either, with tons of variety from silly animal puns, to parodies, to quick, witty one-liners that come fast enough you might miss them. This season got more than a few audible laughs out of me, and it’s perfect to help alleviate the more heavy aspects. 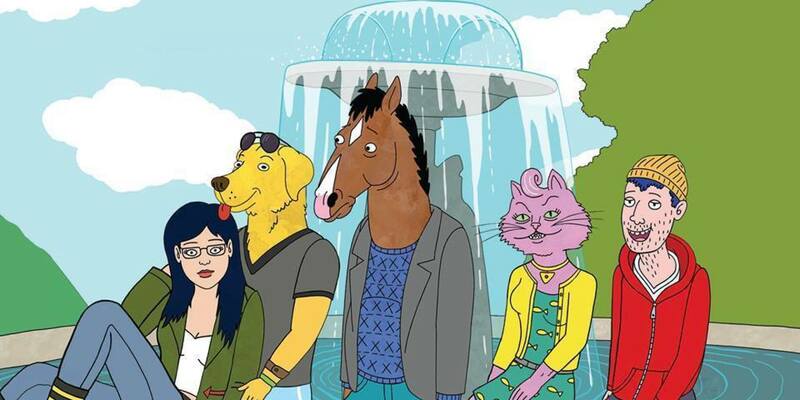 Returning characters like Princess Carolyn, Diane, and Mr. Peanutbutter get a bit more development this time around and feel much more like real people (and animals) rather than jokes for Bojack to play off of. Each has their own arc they go through as well, and they each end up in very different places in their lives by the end. It’s always a bore when shows seem to find a hard time telling meaningful stories with its side characters, but this isn’t at all the case for Bojack Horseman, which sometimes left me wanting to see how someone like Diane’s story was progressing rather than its titular character. I felt Mr. Peanutbutter in particular was a highlight of the season, going from what seemed like a simplistic, happy-go-lucky counterpart to Bojack, to a much better-rounded and honestly pretty sympathetic character. The cast is of course great and I’m glad they take prominent, meaningful roles. However, I can’t help but feel not everyone was utilized expertly this season. Aaron Paul’s Todd continued his stream of wacky adventures, which never really felt as significant as most other characters’ storylines, ending with what I felt was a sort of flat parody of Scientology. He did have a few highlights however and it’s still fun seeing his weird shenanigans every once in a while, but his role in the season seemed oddly disconnected at times, only to abruptly come back in for an ending that would have made much more sense had he had more interaction with Bojack like the first season. Similarly is the newly introduced character, Lisa Kudrow’s Wanda, an owl just coming out of a 30 year coma. Her gimmick has a couple funny moments but feels played out and never fully developed by the end. It’s interesting to see the new dynamic of Bojack in an actual romantic relationship, but it never really goes anywhere too significant as one would have hoped. Perhaps most disappointing is the lack of fan favourite, Vincent Adultman. His gimmick may have dried out if dragged on for too long, but he is by far my favourite part of this show and I can’t help feeling wronged that he disappears less than halfway through the season. While Bojack Horseman’s second season isn’t as surprising, it does come off as much more organic in tone and structure. The first season’s ending left me wondering how they could possibly keep the momentum going, while this one leaves me excited for more. While not everything hit as high as it could, it successfully continues Bojack’s story in a steadier, more eloquent, and possibly more effective way. In the end, Bojack Horseman will leave you with a lot to think about after the laughs.